• First, you need to choose the products you want to purchase, using the menu and filters located on the left side of the page. • The chosen products can be added to the shopping cart by clicking the "Add to Cart" button. To complete your order, click the shopping cart located on the upper-right side of the screen, and then click "Continue to Checkout". • In the steps that follow, you will be asked more details about the delivery address and billing method, you will be given information relating the method of delivery and also the ability to choose the method of payment. These steps are well structured, but should you need further details, do not hesitate to consult our guide on how to place an order on Nexles. Payment can be done with Credit or Debit card. You will be redirected to our partner's secured page. After you place your order, you will receive a confirmation email with the details and information of our EUR bank account. You will have all the information needed to make the payment through an online or bank wire transfer. You will be redirected to PayPal to make the payment from your balance or by card. A PayPal account is not needed to complete the payment. How is the delivery made with DHL? Products delivered via air will be shipped through DHL, with a delivery time of 1 to 2 business days (from Monday to Friday), depending on the destination. The delivery cost starts at 12 EUR, depending on the weight of the package and the country of arrival. 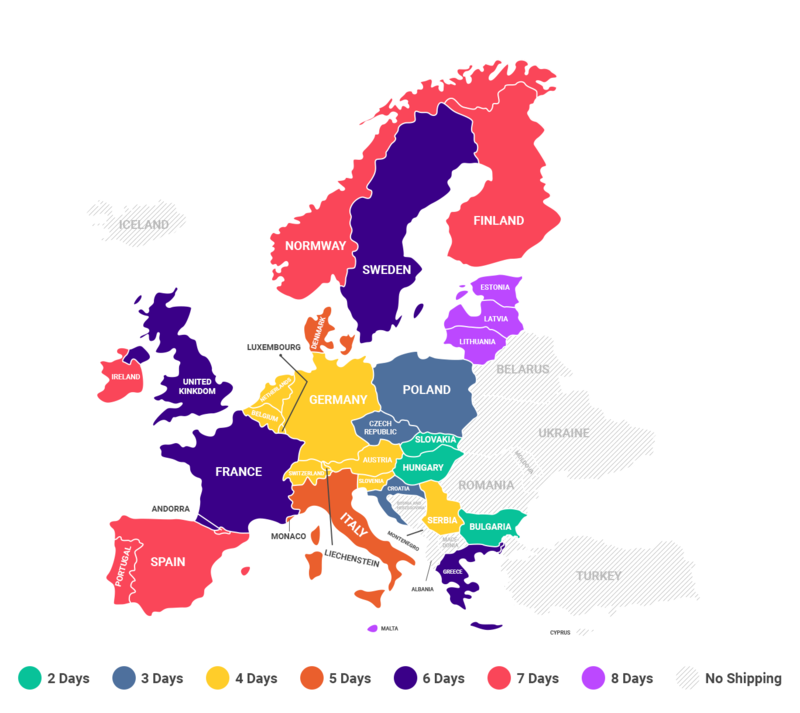 Below you can find the estimated timeframes for delivering parcels in different areas of Europe with DHL. The periods mentioned are shown in working days, which means Monday - Friday. 1 day: Albania, Austria, Belgium, Bulgaria, Croatia,Czech Republic, Denmark, Estonia, Finland, France, Germany, Gibraltar, Greece, Hungary, Ireland, Italy, Iceland, Latvia, Liechtenstein, Lithuania, Luxembourg, Macedonia, Monaco, Netherlands, Norway, Poland, Portugal, San Marino, Serbia, Slovakia, Slovenia, Spain, Sweden, Switzerland, Turkey, United Kingdom, Vatican City. 2 days: Andorra, Belarus, Bosnia and Herzegovina, Cyprus, Malta, Montenegro, Republic of Moldova, Ukraine. *In the regions where customs clearance is needed, delivery with DHL might be delayed by up to 2 working days due to the customs process. An additional fee will be added. How is the delivery made with GLS? Products delivered via road will be shipped through GLS, with a delivery time of 2 to 7 business days (from Monday to Friday), depending on the destination. Below you can find the estimated timeframes for delivering parcels in different areas of Europe with GLS. The periods mentioned are shown in working days, which means Monday - Friday. 8 days: Estonia, Gibraltar, Latvia, Lithuania, Malta, Turkey. **In the regions where customs clearance is needed, delivery with GLS might be delayed by up to 4 working days due to the customs process. An additional fee will be added. 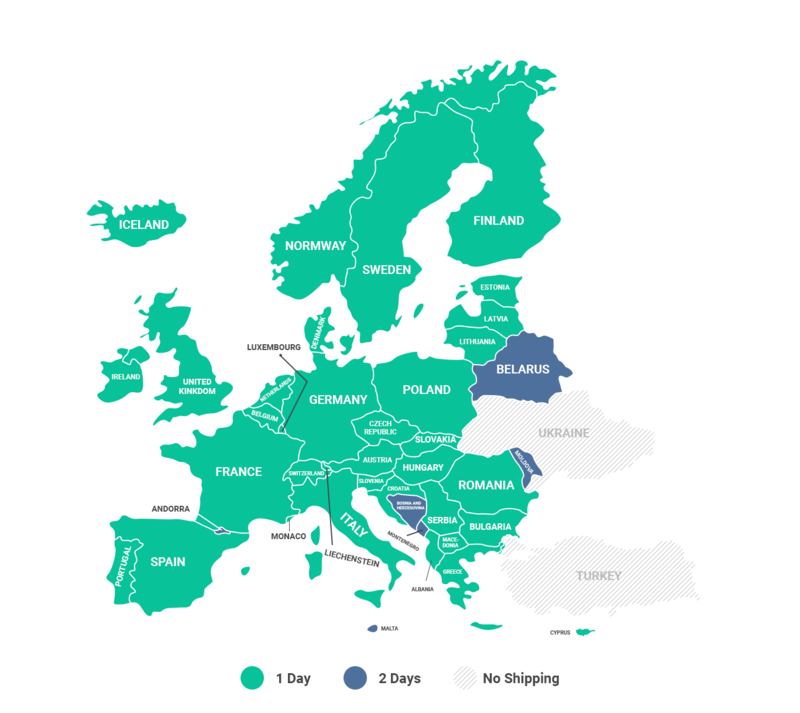 Some products have free shipping, while for others, the shipping costs depend on the country of destination, as well as the weight of the whole package. During the checkout process, the total amount that needs to be paid will be calculated and shown, as you fill in the delivery details. How much do I pay for Customs Clearance? For some countries or regions, a €36 flat tax representing a customs fee, is added to the total amount of the order. In the regions where this tax is applied, delivery can also be delayed by 2 - 4 working days due to the customs process.